It’s the first day of the declutterathon! My goal for the next 26 weeks is to make slow and steady progress decluttering our homes and lives in the hopes that it will create long-lasting change. If you’ve arrived at your computer with lots of energy, enthusiasm, and a box full of black trash bags you may be a little surprised by this first week. While other plans jump right into creating zones and immediately decluttering certain areas, I know that, for some of us, our initial enthusiasm can burn out pretty quickly. We end up feeling overwhelmed and sometimes worse off than when we started. My hope is that by taking small, purposeful steps, we’ll be able to tackle our clutter once and for all. This is going to be a personal journey we’ll take together. The facebook group is already over 600 2,000 people strong so there’s no shortage of people ready to empathize with and support you in this process. There’s also a newsletter that will be going out with reminders and tips to help keep you on track. However, since this is a personal journey, I want you to adapt it as you see fit. If something I write or recommend doesn’t resonate with you, ignore it. If the pace is a little too fast or slow, move at the speed that’s best for you, but don’t stop challenging yourself. If you want to jump right in and start clearing spaces, please do so. Just try not to do so much that you become overwhelmed. Don’t set the bar so high that your goals seem unattainable. We have 26 weeks to work through our homes, and we’re going do our best to use that time wisely while not burning ourselves out. 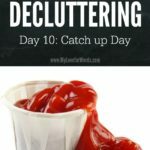 This first week is going to be spent looking at what clutter is, the different types of clutter, and how it affects our lives. Doing our best to answer these questions is, I think, the only way to succeed in the long run. To some of you, this may seem silly or be uncomfortable. 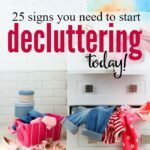 You may want to just skip this stuff and run to the nearest junk drawer, but I genuinely believe that taking care of clutter isn’t about buying the right bins or having the right labels (even though I do love a nice printable). Clearing clutter once and for all can only really be done if we figure out why we have it in the first place. I have tried, time and time again, to get my house organized. I’ve bought a Container Store’s worth of bins and spent entire days making rooms look perfect only to have them eventually end up cluttered again. I thought, “If only we had more space, we’d have no problem remaining organized.” We then moved into a much larger home, and the new house ended up cluttered too. That’s when I had my epiphany that clutter’s like a koi fish, and my cluttered home was about more than just having too much stuff. A cluttered home is like your house having a fever; It’s a symptom of a larger problem. We can lower temperatures and sort piles until we’re blue in the face, but those are nothing more than temporary fixes. If we don’t address the root causes of our clutter, it’s bound to eventually return. Just because we won’t be filling garbage bags right away doesn’t mean we won’t be decluttering or doing work. Honestly, this first week may be the hardest week of all because we’re going to have to be brutally honest with ourselves, and the first area I want us to think about is our time. Over the next four days, we’re going to track how we’re spending our time. Try to be as honest as possible and go about your day as you usually would. Don’t change what you’d normally do just so it looks good on paper. I made two versions, one with times and one without in case these don’t work for you. Later this week, we’ll evaluate how we’re spending our time and come up with a plan for week two. The second task for the week is to choose one job to start doing every day. Ideally, this will be one small task that will take less than five minutes to complete. This way we’re seeing some progress being made in our environments since I’m sure we’re all anxious to get started. I’m going to start making my bed every day, but you could also work on keeping your kitchen sink empty, putting your shoes away, keeping clothes off the floor, or keeping a kitchen or bathroom counter clean (even if every other flat space is buried in piles). These small steps will help us slowly establish new habits and create our new environments. Tomorrow, we’ll talk more about different types of clutter and why we have it, but for now I’d love to know, what small task are you going to take on for the week? My 5 min task is going to be keeping my sink & dish drain empty. I don’t have a dishwasher. …..
Before Thanksgiving I had run and emptied my dishwasher every day for like 20 days in a row or something like that. I’d love to get back into that habit. I think I will start with that one even though, in my mind, I’m thinking, “well, I already do that so it’s like cheating.” Yeah. I’ve got a dishwasher full of clean dishes that sat there this morning before work, so no, I don’t. Originally I was going to make my bed everyday. My husband woke up sick today and he’s still in it so I don’t think he’d appreciate it. I’m deciding between keeping the sink empty or straightening living room before I go to bed. This post brought back a memory. When we were first married, my husband and I shared making the bed each morning. One morning I was impatient that he was still in bed and I started to make my side, (while he was still sleeping) Needless to say that did not go over so well. My husband did that to me early in our marriage too! Not to copy you Emily, but mine will also be to make my bed every day. So simple, yet so overlooked! I already make my bed everyday as soon as I get out of it so I will start a load of laundry everyday until there is none. 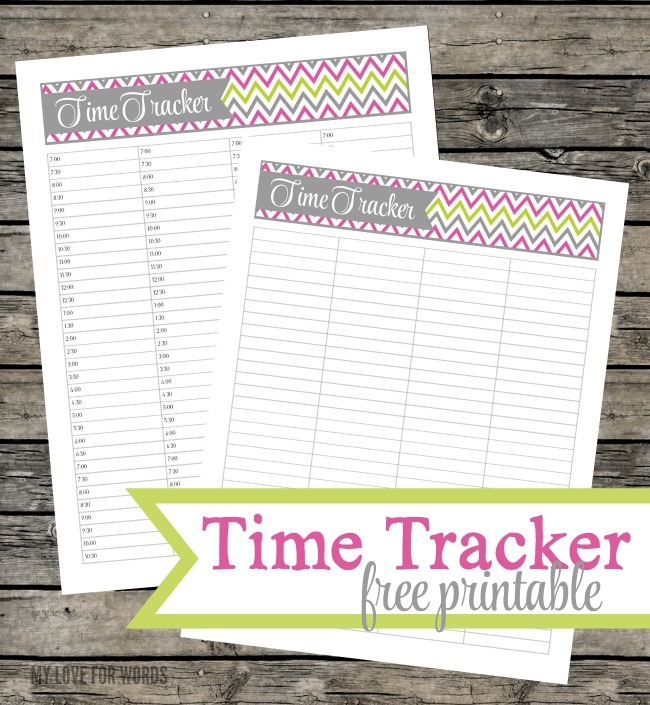 What font did you use for your time tracker time sheet. I love it! For me I clean off my kitchen counter before I go to bed every night. My new task will be to clean off our master bath counter too. Since you can see my bed from the living room, I’ll start with making my bed daily & also keeping my kitchen sink empty! I’m very excited about this because I just moved & am still unpacking & trying to organize my life!! Okay, my little task is to take care of the mail daily! All that incoming paper is my nemesis. Alot of my total cleaning is going to end up being sorting thru boxes of papers that never got dealt with properly. So what I want to accomplish is to prevent first any further build up! I’ll be taking some things to Goodwill to make room for those new Christmas goodies. I will be making our bed everyday! I need to keep my counters free of clutter, and I need to sweep my floor each day. I’d like to delete 50 emails a day. Hubby keeps them ’cause ‘you never know’, but really, how many emails do you EVER go back and read after 3 years? I should do the same. I have so many that I know I don’t need it’s ridiculous. I am going to tidy my kitchen bench each night. I think you’re onto something. 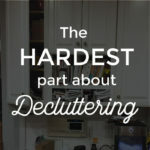 I just discovered your website, and am enjoying going through your articles on de-cluttering. 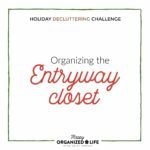 I don’t plan on joining the declutterathon per se (I have been amid my own “declutterathon” for over a year now), but I love reading tips to keep motivated. 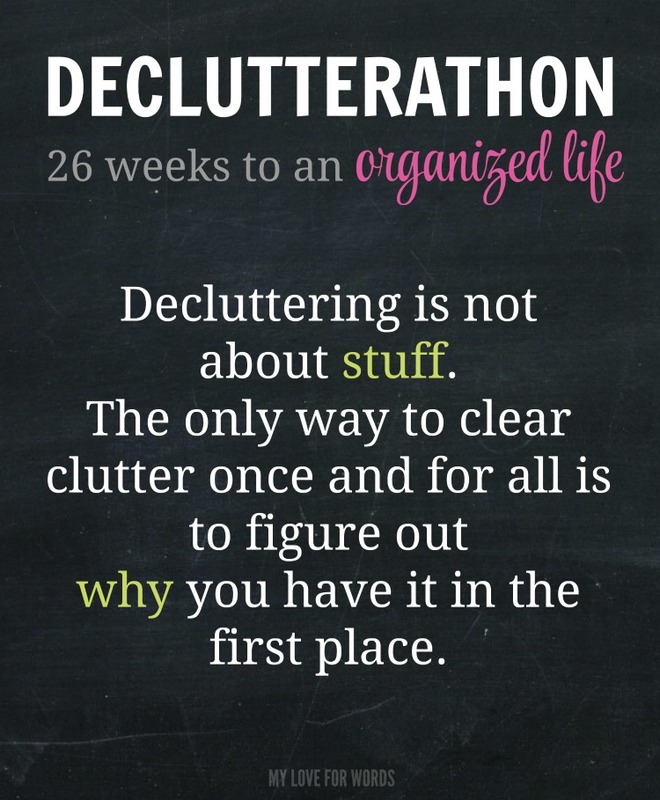 It’s definitely a process and I wholeheartedly agree that it takes time and you really need to address the mental aspects of clutter in order to make an real change and maintain it. It’s a lot like weigh loss, really. I’ve found that the deeper I get into my own decluttering, the more I am now starting to question purchases (do I REALLY need this?) and really evaluate what’s important in my life. It’s a lot more involved than I could have imagined when I first started to get rid of a few things here and there. There are certainly days where I feel more discouraged than motivated, but overall I’d say that I enjoyed the process. We live in a tiny one bedroom apartment and are planning a huge move, so that’s my main motivator to declutter. I want to maintain a nice, decluttered home when we have more space, though. It’s amazing how I’ve gotten rid of some items in the past few months that I would never have dreamed of getting rid of a couple of years ago, just because I was a packrat! Questioning purchases is a great step to take to avoid having a clutter problem in the first place. I’ve started working on that myself, but I’m still a bit of a packrat. I hear you, I’m finally able to get rid of stuff with less discomfort, and once it’s gone I rarely remember it. We are also wanting to sell our home and move closer to husbands job, but after 10 years in one house I have 10 years of clutter to go thru. I had plans for making things out of some of my junk, but I’ve never gotten to it, or forgotten what the art idea was. Thanks to my daughter i’ve donated a lot of stuff we never got to when she was a kid, and hopefully some child will have a chancecto do them instead. We threw out anything damaged, broken, or just plain trash. I still have tons of coke tabs, and lids that I want to use in crafting. I want to learn welding, but I have to much junk in the garage to work in. I use to pick up, what I thought was great finds on trash days and repurpose or recycle for cash. I took apart computers, tvs, and anything I could get into my car, to recycle, or use parts for crafts. But I have a hard time getting thru tge stuff in a timely manner, so it backs up, and I have a mess. I was doing great before winter, then it got to cold in the garage even with a heater. I have asthma attacks aggravated by cold air, even the basement gets to cold for my breathing. I don’t always feel well either due to fibromyalgia, depression, and arthritis. I just keep trudging thru my mess, one day at a time, one box at a time, and at my own pace. That’s all we can do, work one day at a time. I understand though. I tend to start with the best of intentions and then things get backed up and take forever to be completed. We’ll get there, step by step. That is such a wonderful idea. However, we are getting ready to put our house on the market and I really need to declutter my whole house in like a week. But for maintaining and keeping everything decluttered once we move I love this. I’m going to spend 5 mins each day focusing on the little things. Great post! My 5 min task is going to be to put away the clothes at the end of my bed everyday! Thanks for sharing! Visiting from the Freedom Fridays blog hop. I’m going to keep my dining room table clear. It makes me feel so much better when I get home from work! I will address all incoming mail before even brining it in the house…recycle bin just outside door. Should take 30 seconds to 1 minute. Remaining 4 minutes spent on mail ,flyers etc accumulated from before. I will keep my kitchen sink empty. That’s a good one, Shai! I am going to clear off the kitchen island every night before I go to bed. This will be tricky because there are 4 people (5 if you count the nanny) contributing to the “stuff” there, but I’ll find it all a home. I will keep one worktop in the kitchen clear. If I cannot decide what to do with something, I will dump it on the smaller worktop. I find decisions hard so don’t want to overface myself. That sounds like a great decision, Melanie. I bet just keeping that one worktop clear will help get the ball rolling for other areas in your life too. Please keep us posted on how it goes.